Hoyle, Tanner announces our selection by the City of Nashua for the construction of trail improvements and a new pedestrian bridge across the Nashua Canal. We are excited to take part in a project that will enhance the recreational development of the Nashua community! As a result of this project, the eastern end of the Heritage Rail Trail will connect to an existing rail trail in Mine Falls Park, a major area of community recreation and enjoyment. 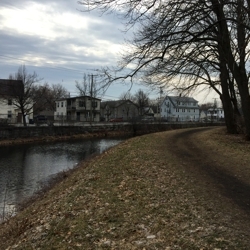 We will provide structural and civil engineering design and construction administration services for the construction of roughly 490 feet of 8-foot-wide paved trail improvements along Everett Street, in addition to a crosswalk across Ledge Street and a 90-foot bridge across the Nashua Canal. With Doucet Survey and Historic Documentation Company, Inc. as subconsultants, Hoyle, Tanner’s transportation and structural teams are looking forward to working with the City and further developing the area for visitors and residents.